Lord Jesus Christ, who didst willingly walk the way of the cross: Strengthen thy Church through the example and prayers of thy servant Alphege to hold fast the path of discipleship; for with the Father and the Holy Spirit thou livest and reignest, one God, for ever and ever. Amen. Lord Jesus Christ, who willingly walked the way of the cross: Strengthen your Church through the example and prayers of your servant Alphege to hold fast the path of discipleship; for with the Father and Holy Spirit you live and reign, one God, for ever and ever. Amen. 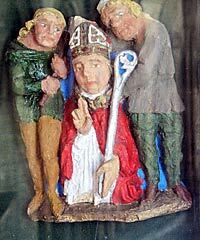 In 1005 Alphege became Archbishop of Canterbury. In 1011 the Danes overran much of southern England. The payment of the tribute agreed on (the Danegeld) did not stop them, and in September they captured Canterbury and held Alphege and other prominent persons for ransom. The others were duly paid for and released, but the price demanded for Alphege was a fantastically high 3,000 pounds (worth of course, far more than modern pounds). Alphege, knowing the poverty of his people, refused to pay or let anyone else pay for him. The infuriated Danes, at the end of a drunken feast, brought him out and repeated their demands. When he again refused, they threw various objects at him (large bones from the feast, for example) and finally an axeman delivered the death-blow. Their chief, Thorkell the Tall, tried to save him, offering all his possessions except his ship for the Archbishop's life. By his death Alphege became a national hero. When the Dane Cnut (Canute) became King of England in 1016, he adopted a policy of conciliation, and in 1023 he brought the body of Alphege from London to Canterbury, where he was long remembered as a martyr, one who died, not precisely for professing the Christian faith, but for exercising the Christian virtue of justice. In art, he is shown with an axe, the instrument of his death, or as a shepherd defending his flock from wolves.